Have you been searching for a tool that will help you better target and understand your Facebook audience? Are you interested in learning about the types of people you reach before you spend money on ads? Sometimes even the best Facebook ads fail because the right type of audience is not being targeted. In this post, we'll go over the steps you need to take to ensure you know how to effectively target and reach your audience. Facebook insights provide page owners with the demographics of their Facebook fans such as location, age, gender as well as other information like the time of day that the majority of fans are using Facebook. By analyzing and understanding the trends and usage, you can be better equipped to improve your page and create more brand awareness and business. 1. Click on insights. 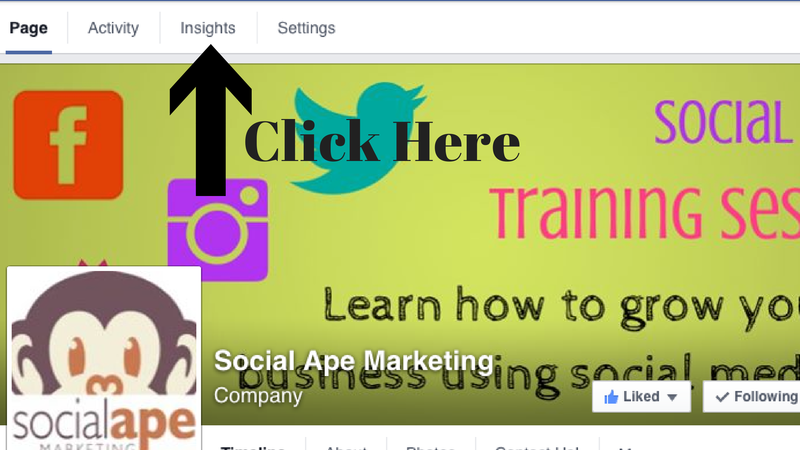 To see the Insights of your Facebook page you first need to click on the Insights tab above your page's cover photo. When you click on the tab it will direct you to the Overview page of which includes topics such as: Likes, Reach, Visits, Posts and People. Keep in mind, only page owners and administrators can view the insights of your Facebook page. 2. Knowing your audience. Click on the People tab to view the demographic information about your Facebook fans, the people that have been reached by your page, and the engagement of fans of your page. This tab can help you determine whether or not you are reaching the desired audience for your business. The fan tab shows you the gender specifics as well as the locations of your followers. For example, if your page consists of more female fans than men, you would want to target Facebook ads more towards females and the type of content that women would like to see. By knowing your audience, you will be able to better target the type of people who are interested in your page and business. 3. Knowing the best times to post. When you click on the Post tab on your page, you are shown a graph of the times and the numbers of your fans that are online. You can move your cursor over the purple graph to see the numbers of your fans that are online at certain times. By looking at this graph you can learn the time of day that most of your followers are on Facebook. There are usually 2-3 times a day that are best to post compared to others. 4. What content do people want to see? Beneath the time graph (shown above) you should see a more in depth table of individual post data based on your past posts. This will show you the type of post (text, image, link), targeting, reach and engagement of each individual post. By looking at this data, you can see what type of posts people are interacting with the most and determine the type of content that your fans are most interested in seeing. For example, Social Ape Facebook fans tend to engage more with posts that include inspirational posts, event announcements and updates of the company. By using Facebook Insights, you can collect data that will help you to determine who your audience is as well as the type of content they want to see. Using this data can be a tremendous help when creating Facebook Ads and creating organic content as well. Facebook Insights is free so it's a no-brainer to take advantage of using the tool when creating an awesome Facebook strategy to help your business grow.